Today, I woke up at about 3 a.m. There was a blue light coming from the dining room. I figured that M. had left his phone plugged in for the night. The light was bugging me – but as I walked in to turn off the light, I realized puppets were all gathered around our guest’s smartphone – screaming with glee as well as doing a victory dance full of vim and vigor. Not knowing what to do, I joined in back of the circle of flat wax papery puppets, all aglow with the blue of the smartphone screen…and there they were – the iKaragöz shadow puppet troupe – on our houseguest’s phone. Özel Türk edisyonumuz(sesli)”iKaragöz” olarak geçmektedir. 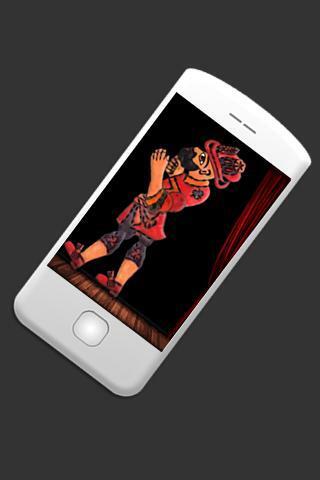 This entry was posted in Introducing the Karagöz puppets, Visits from the Karagöz puppets and tagged android, ikaragoz, iphone, Karagöz and Hacivat, smartphone. Bookmark the permalink. . . bad enough with a laptop consuming my time (and incurring J’s wrath when things that should get done are left undone). I avoid anything with an ‘i’ prefix like the plague, or a slowly by slowly death from a thousand cuts/just let me check this! We’re far too poor for an i-thingy!